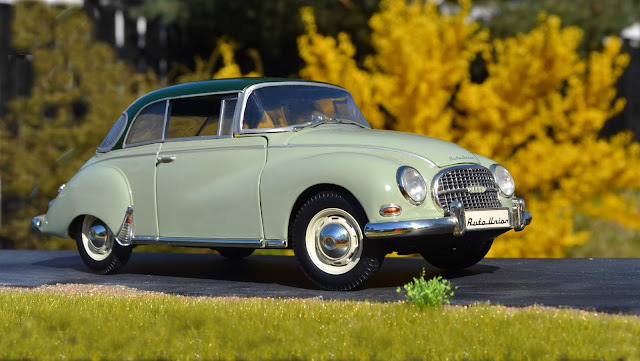 Looking out for cheap cars in 1:18 on ebay has resulted in the arrival of an Auto Union 1000 S - a sports car with a 55 hp two stroke engine and a top speed of 130 km/h. 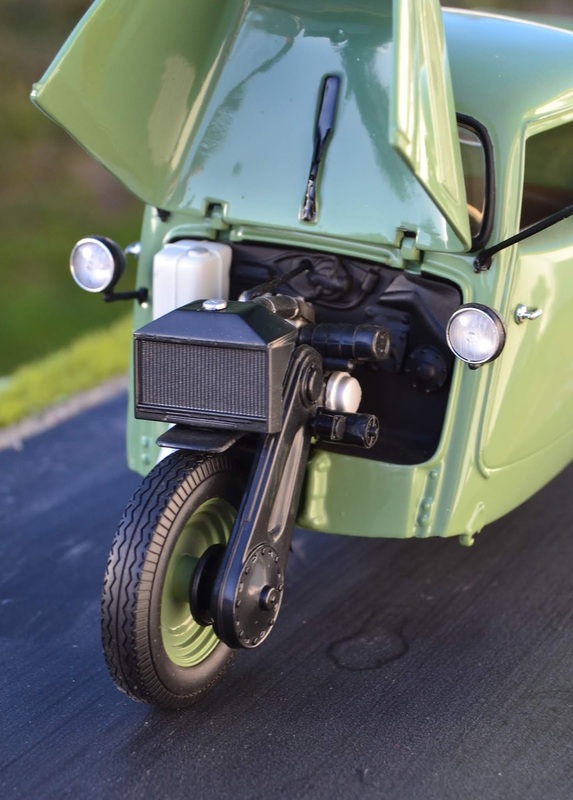 The model came out in 1958 and its relative modest price and size seemed to be a good fit for a small business man's sports car in rural Nystrup. It could be Nystrup Gravel director Holm's replacement for his pre-war Opel Kapitain. His daughter having moved to Copenhagen to go to university, he could now manage with a sligthly smaller car. My model is a Revell 1:18 die cast model with two opening front doors, opening bonnet and detailed engine. Once again a boxless bargain at 20 € . This car has obviously been in a collection in a smoker's home. After some careful removing of dust it has consequently spent 14 days in one of my sheds and is now practically free from the odeur of old tobacco. I have used the same trick with second hand books. When I get around to it, the car will have Danish license plates, minor weathering and perhaps the rear license plate will have to be replaced? It looks enormous. Progress on my Lister continues. I have fitted switch and charging socket under the bonnet and wires have been soldered on ready for conneting to RC reciever unit and battery. An open topped loco, the Lister has to have a driver installed and I have been wondering what figure to choose. I wasn't particularly satisfied with my first 16 mm scale figure from Modelu, but I finally decided to order another Modelu figure anyway. Printed in black plastic the figure is being tested in place on my Lister. It is hard to see much detail on the figure due to the black plastic, but the level of detail is identical to my first Modelu figure. Some of the wires under the bonnet can just be seen from this angle. Oil and petrol tanks are glued to a plastic bracket over the electric installation. The hood can be lifted off to gain access to the electric equipment. The figure is Modelu's figure no. 1408 'Seated Workman'. I liked the sort of indifferent gazing of the figure. Just how I imagine one would feel running a slow moving Lister back and forth on a short industrial line all day long week after week. I'm now in the proces of adjusting the figure's rear end to fit the seat box - itself to be built now in plastic card to replace the foam board prototype. I have also built a new brake column as the kit's original looked quite undersized and flimsy when compared with drawings. The new one was made from a piece of plastic turned with a file in a drill. A base plate from plastic was fitted with four bolt heads and glued to the bottom of the column. The top was fitted with two rings made from solder wire and the original hand wheel fitted. The kit's original brake column next to the home made version. 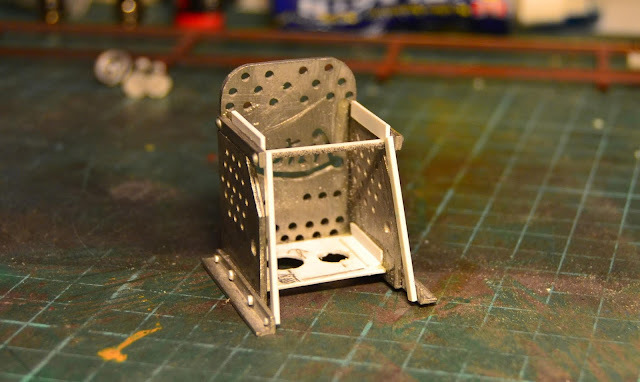 More news about seat box and plastic surgery to the figure in a coming post. Hopefully I will also be able to report that the RC equipment have arrived. A considerable amount of time has passed since I ordered the items and although a patient soul I am increasingly growing tired of waiting. 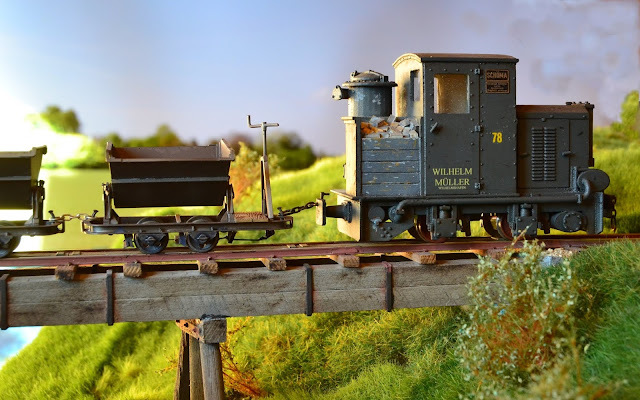 On my old 1:35 scale Nystrup Gravel I had some rather good looking lorries made from kits and kit conversions. In 16 mm scale the variety when it comes to lorries is markedly smaller - to put it mildly. 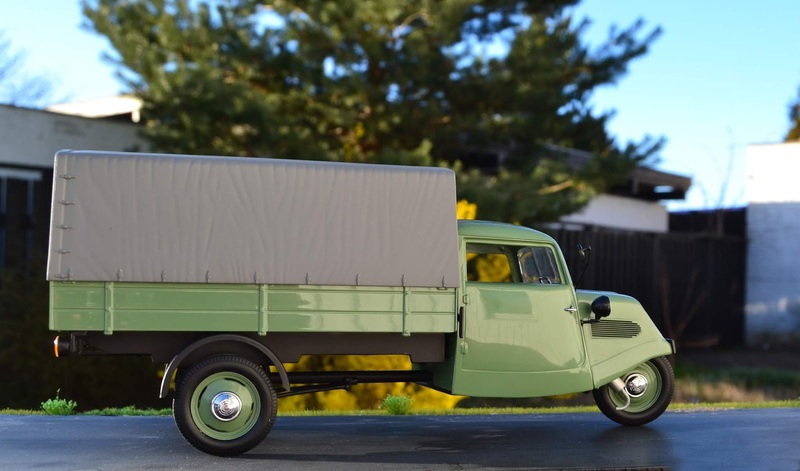 Unless you want modern tractor units there is practically nothing exept a few horrendously expensive Mercedes and Opels in 1:18 scale. By more or less coincidence I was lucky to find a Tempo Hanseat three wheel lorry on ebay and to win the auction quite cheaply for a closing price of 22 €. The model has now arrived and I have handled and examined it, finding it good value. The Tempo Hanseat unwrapped and photographed in my garden. I had to superglue one hubcab centre in place, having separated from the wheel during transport from the former owner in Germany. The Tempo Hanseat is an example of 'tax evasion engineering'. In Germany in the late 1920's cars not having four wheels were exempt from taxes and the driver didn't even have to have a license. Consequently several makers offered 3 wheeled delivery lorries to small businesses. 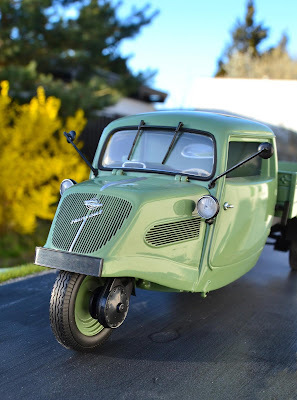 One of those manufacturers was Vidal & Sohn offering 3 wheeled vehicles in several sizes and even a small 4 wheel van under the trademark 'Tempo'. Dark blue Hanseat outside a Tempo sales room in Hamburg, 1949. 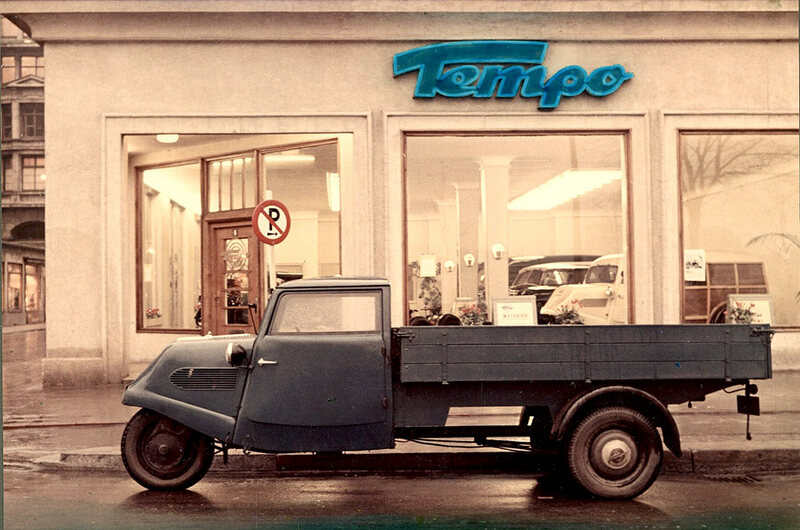 Image from this online article on the Tempo history. The front wheel can be turned a little for some dynamic posing. Here it is pointing straight ahead. The bonnet opens as on the prototype, revealing a simple model of the lorry's 12.5 hp 400 ccm engine. Most prominent in this view is the radiator and petrol tank. 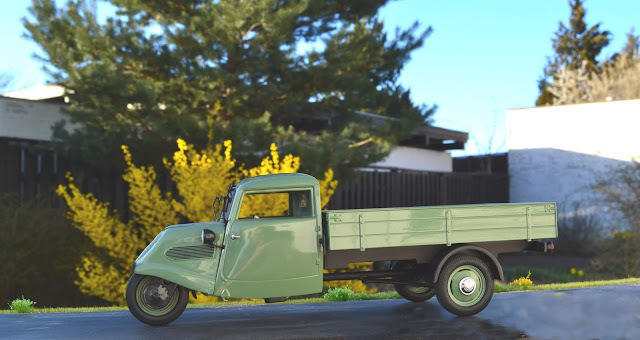 The model is the 1:18 scale Minichamps 1952 version of a Tempo Hanseat with the high load area. The vehicle has a removable tarpaulin roof of a medium decent quality. I will probably be using my Hanseat without it, as I plan to put the vehicle into service of a local craftsman. I will fit license plates and decals, tools and building supplies in the rear as well as adding a little weathering. The high tarpaulin cover makes the Hanseat loose its sleek and 'racy' lines. And how, may one ask, could I be fortunate enough to buy this nice model for 60-80 € less than the usual price on ebay? It didn't have a box. 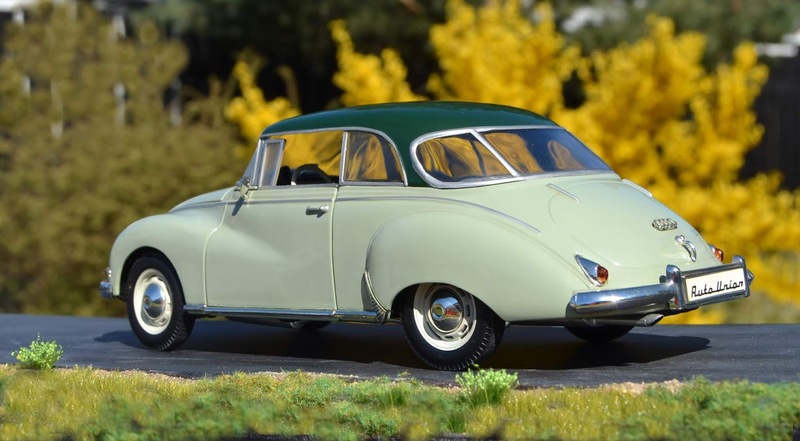 Without a box these car models aren't worth much on the collectors' market. 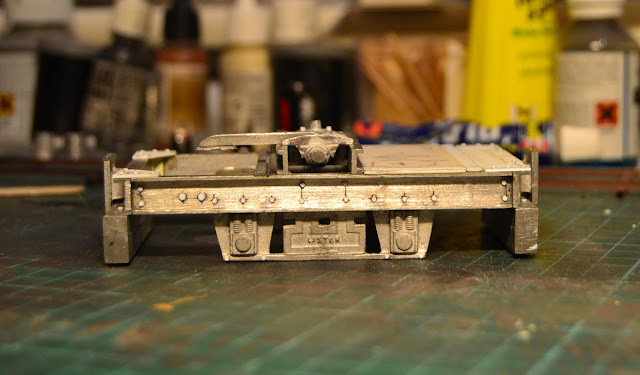 Once I'm finished 'mistreating' it with decals and weathering the model's value will have gone completely. For a collector, that is. On our way home from a company event a colleague/friend and I visited the remnants of a metre gauge railway closed and lifted in 1930. 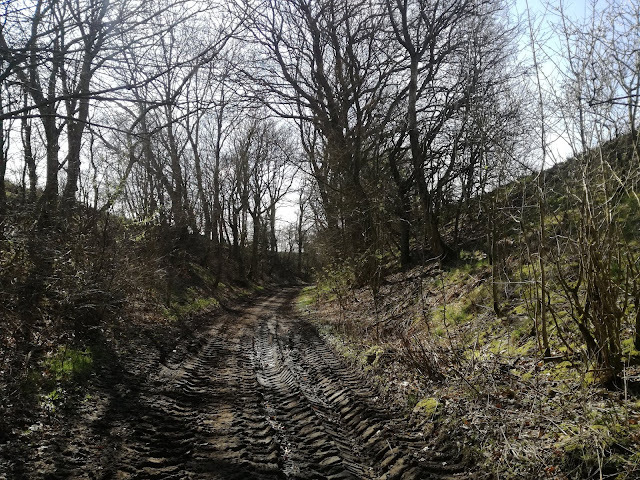 Despite being closed so long ago, surprisingly many traces remain, including several station buildings, bridges and long sections of embankments. While the station buildings may interest some, I find the bridges and earth works much more interesting. Probably because they have more relevance for the type of industrial railways I'm interested in. I have a hard time visiting dismantled railway lines without imagining how they would look in model fitted with scale track and trains. 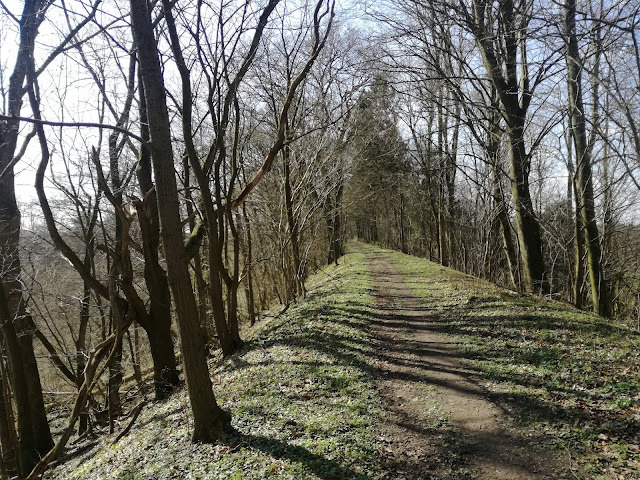 Kolding-Egtved Railway was a small private railway wirh a gauge of 1000 mm and a length of 27.8 km. While the track was lifted in 1930 there are still many traces of the railway. Here is a cutting northeast of Almind. Obviously the cutting still carries traffic today. Northeast of the small town of Almind there is a 600 m long very well preserved combination of cutting and embankment easily accessible from a gravel road. 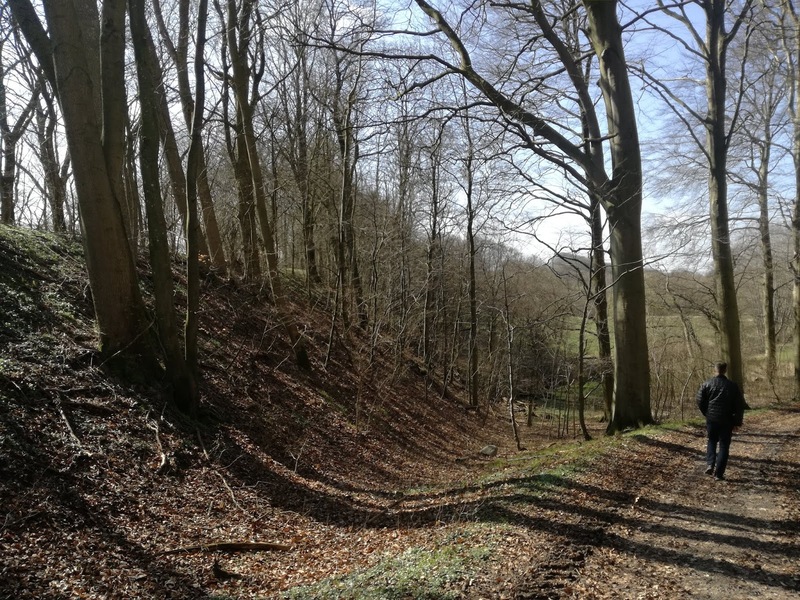 The curved cutting leads to an, by Danish narrow gauge standards, impressive embankment over a stream. The northern end of the embankment. 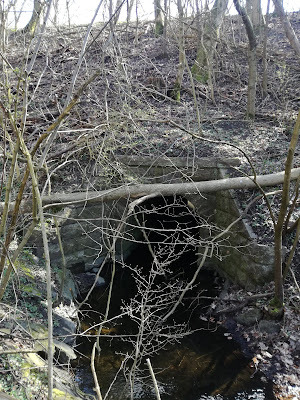 The terrain falls steeply to a stream led under the embankment in a small tunnel. The tunnel leading the stream through the embankment is built from stone blocks and red bricks. 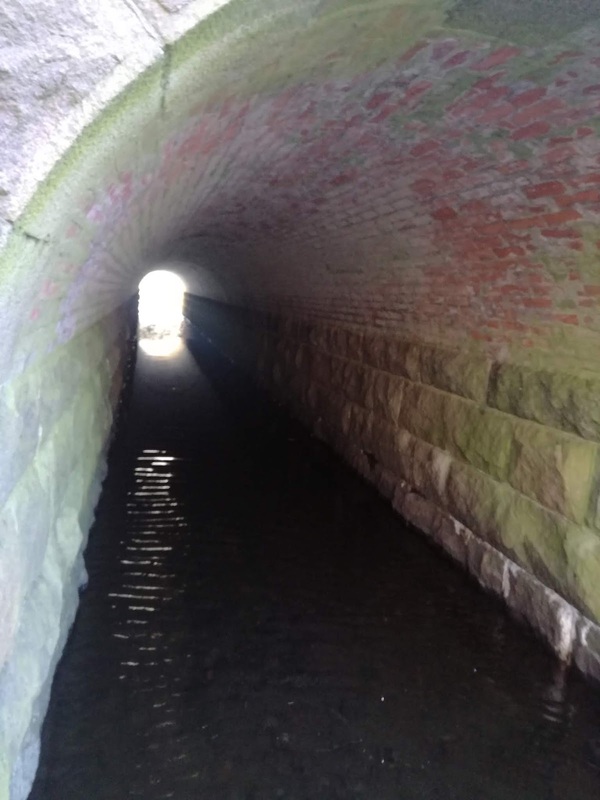 A view through the tunnel shows how the construction is in a near perfect state despite almost 90 years without maintenance. How well would a construction built today survive without maintenance? The top of the Almind embankment is well cleared and showing trace of regular traffic. Further north in the small town of Gravens two steel girder bridges are preserved and marked as local heritage locations. From the former station building in Gravens, one can follow the old railway line for almost 3.5 km to the next station Brakker. Most of the distance laid out as a bike path or gravel road. 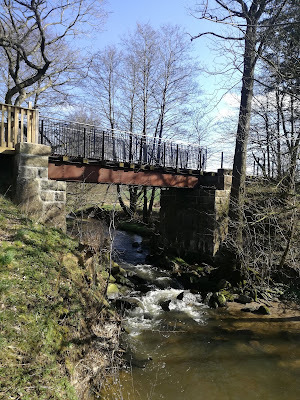 The preserved bridge east of Gravens. 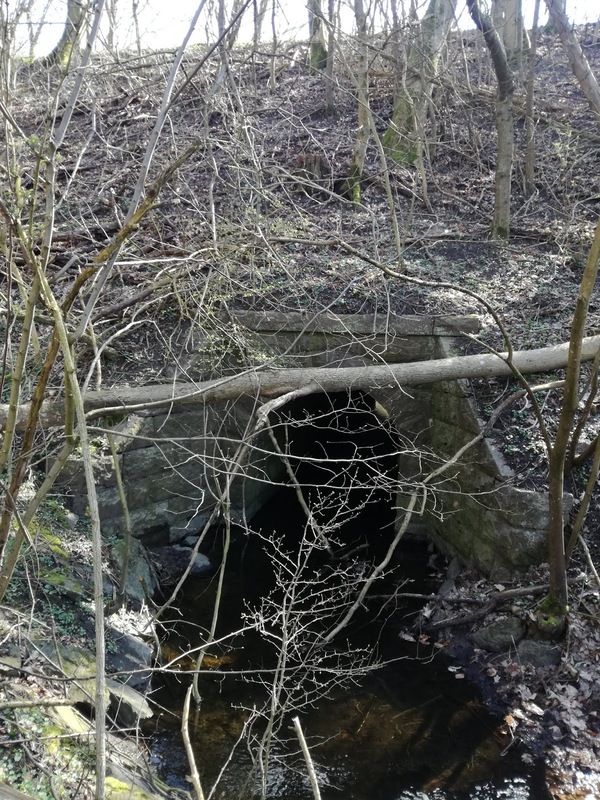 The bridge west of Gravens is of the same type, but the girders much heavier attacked by rust. Kolding-Egtved Railway was opened in 1898 and built with 12.4 kg/m rails and untreated pine sleepers. Some of these were quickly replaced by steel sleepers as rot set in. KEJ M 1, a petrol powered AEG-railcar with a single bogie coach in Kolding 1930. The number of spectators could indicate that this might be the last train on the line? KEJ in the proces of dismantling. The work party is working uphill towards Kolding. Despite no news for a while, I continue to make progress on the Lister Rail Tractor. I have been fitting bolt heads, an assortment of small brackets and gear box details. 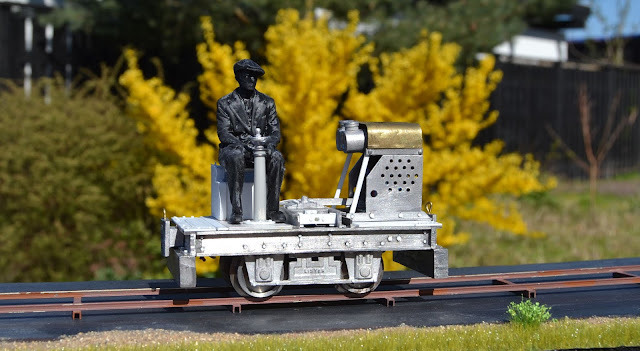 In addition, the parts needed to finish a running model locomotive is finally on their way to Denmark. Due to unfortunate delays in production of some of the electronic components the wait has been quite long. But then again, I would have been too busy with other things to use them even if they had arrived earlier. Having studied drawings and prototype information I decided to completely sand away any bolt heads on the side frames. I should have done so while the frame was still unassembled. New bolt heads were fitted according to drawings and photos. I used sliced hexagonal plastic lengths picked up by the tip of a sharp knife blade, carefully dipped in a pool of AC-glue and placed on the model. I had marked up each bolt head's position with pencil in advance. Additional bolts were placed on the end frames and top corner reinforcements. All details sanded off one of the frame profile. Bolt imitations glued on with AC-glue. The top of the bonnet was supplied in the kit as two white metal parts. As I had narrowed the bonnet slightly and as white metal parts were very thick and clumsy, I replaced them with a homemade part cut from nickel silver sheet. I bent the rather hard nickel silver over a former made from wood and the kit parts. I made a few dents in the bonnet as on the Dutch Lister I use as inspiration for my model. The bonnet during construction. I still need to figure out how to mount oil and petrol tank. The floor is drilled to take a SPDT switch and recharge socket. 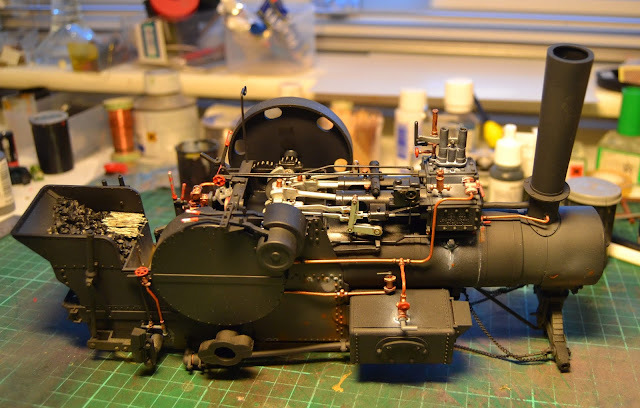 Current status on my first 16 mm scale locomotive. ...and a look at the Dutch Lister that serves as inspiration. My model will not be a scale model of this prototype, but share some of its distinguishing features. Photo: Arnound Bongaards. 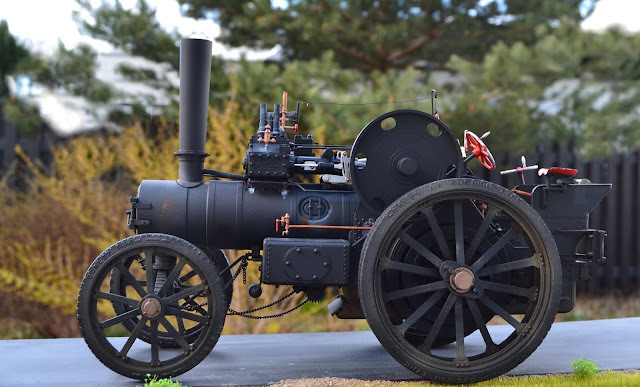 Being slighty embarrassed by my lack of progress lately I have speeded up my work and the traction engine from Hansen haulage contractors is now finished. I took it out in the garden for a quick photo session that nearly ended in disaster. We are currently plagued by heavy winds in Denmark and as I have not glued wheels and axles, the traction engine suddenly took off, propelled by the wind. Luckily I managed to catch it just before it rolled of the photo plank! Hansen's old traction engine parked in the road side.The driver must have gone for a brief pause in the woods. 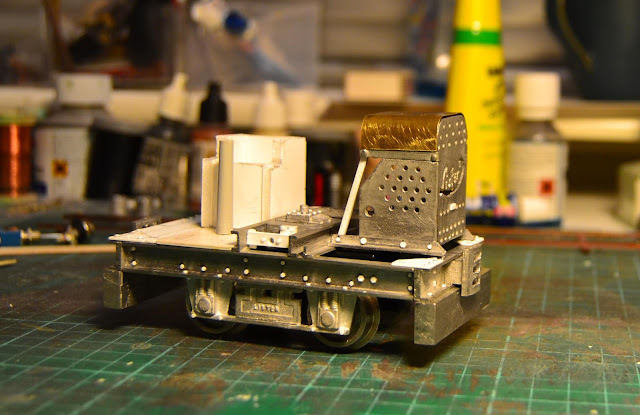 Most of the basic colours was applied when I mentioned the traction engine in the last post and I basically only needed to apply weathering and the small details I had fabricated. I had applied subtle tonal differences in the base colours from the start to reflect the different types of impact smoke box and cab area are exposed to. I added some chalk deposits around valves with the air brush. I followed up with small streaks of thinned white oil paint. 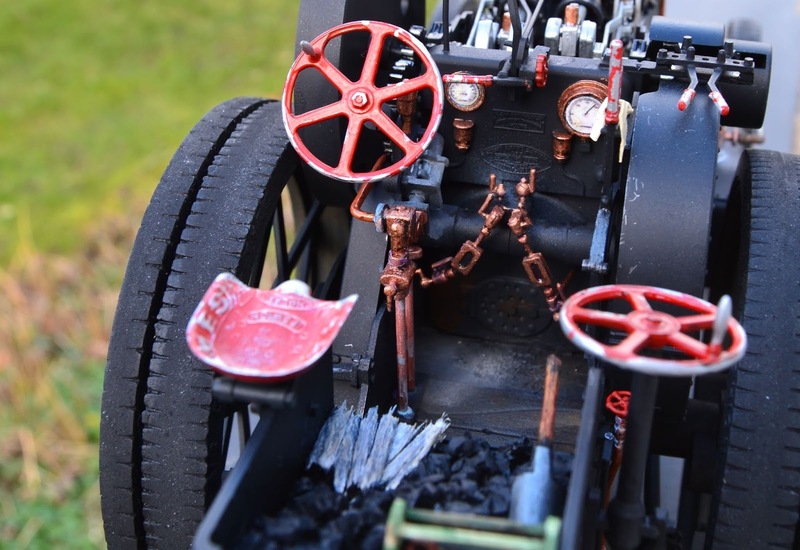 Picking up the air brush again, I dusted the lower parts of the traction engine with light earth coloured road dust, adding a little gloss black with brush on the threads ot the brake gear to simulate grease. Weathering in progress. I have air brushed rods, motion and the area under them with gloss varnish to simulate the shine of an oil soiled environment. Apart from the small tool box, I made a coal shovel from brass and a cut down tooth pick and added a piece of cloth from copper foil postioned on the forward/reverse control handle. The cab floor was supplied with a small pile of ash and dirt in front of the fire box door, weathered with pastel chalk powder. Worn metal surfaces were touched with a soft pencil, minor scratches around the cab area was made the same way. While the driver is off the engine the cab can be studied. The gauges are printed paper discs flooded with gloss varnish. Wheels, handles and seat chipped with chrome and air brushed with gloss varnish to represent wear. The chopped up remains of someone's old shed is positioned for starting the fire. A view from above. 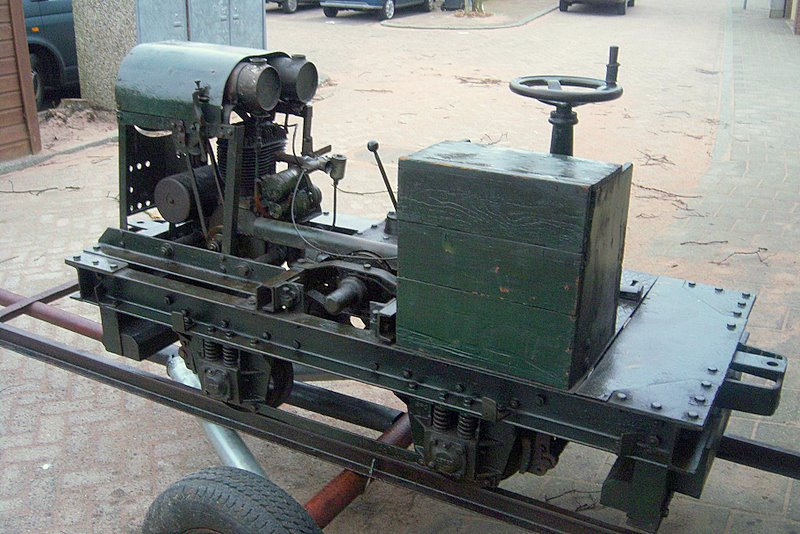 How someone came to fit a seat from a Ransomes engine on a Garratt is a mystery. Perhaps a driver's favorite seat having followed him from an earlier engine? The driver is back in the cab. He seems to be making his mind up if he really wants to put the engine in forward and drive off. 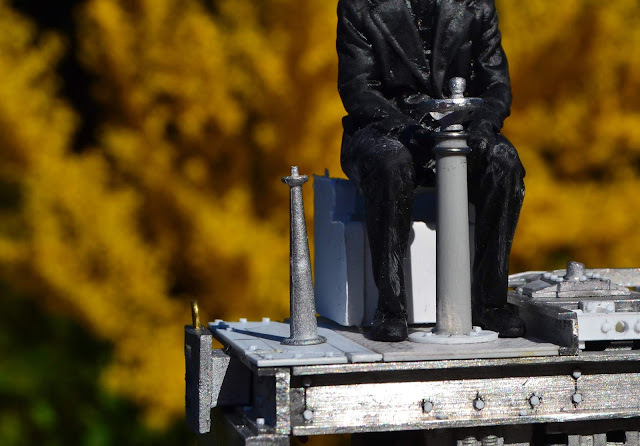 As my only 16 mm scale figure it has to perform every task needing a human shape. Well, it's been a February with a lot of deadlines at work. Articles, tenders and exhibitions to prepare and finalize. Also some projects on the 1:1 scale vintage railway HVB, where I spend some of my spare time, have been swallowing up time, too. Still I have been able to sit at the work table now and then, but have precious little to show. 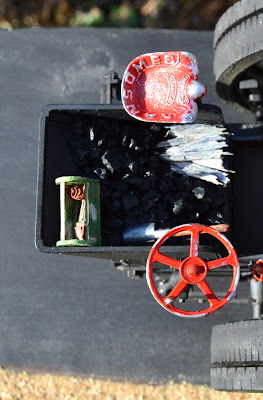 Since last post every part of the traction engine has been painted. Mostly black and dark grey, but brass, copper, gun metal and red were used as well. Weathering is now in progress. Some of the equipment to be fitted to the engine is also in progress. 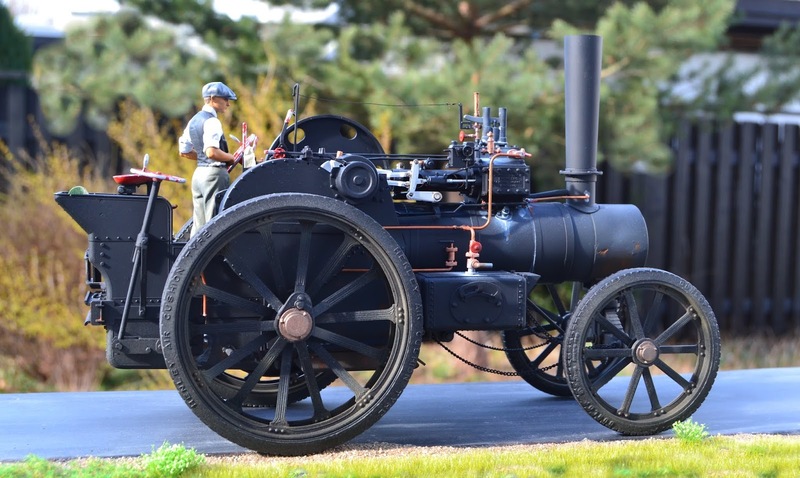 I hope a small selection of hand tools and personal belongings can make my traction engine look like a 'living vehicle'. A small wooden tool box for the traction engine. The box is built from scraps of wood. Currently it is slowly filling with tools, wire and rags. Recently I have finished stage 2 of my great 1:35 scale clear-out. Currently I have no more 1:35 railway models for sale as a few have been saved for exhibition purposes on a narrow gauge vintage railway along with my 1:35 scale modules. There are still a few road vehicles on the sales list, though. 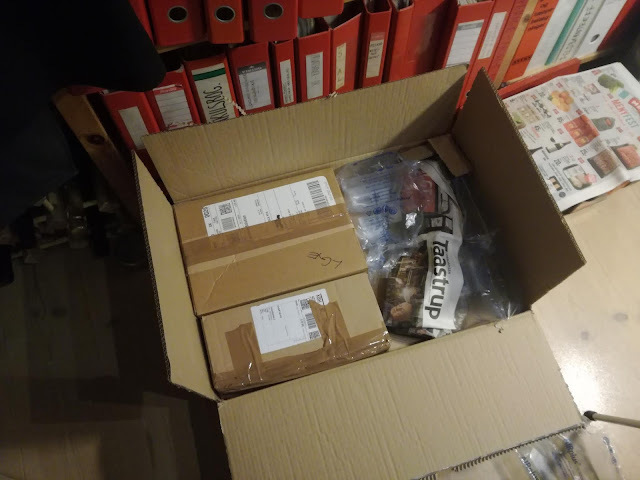 I'm also beginning to drag out all the kits I have had stashed away in boxes in the loft. There is a few original 13'eme Dragon 1:35 Pechot wagons among the unbuilt kits. Write to nystrupgravel@gmail.com if you are interested and I'll send a list. Parcel almost ready for send-off. All the locos and wagons I had made wooden boxes for, presented no problems and all have arrived at their new owners undamaged. I was more worried about this particular parcel, that contains several rather flimsy road vehicles with open doors, direction markers and exhaust pipes. To cut down on transit damage I had packed models in several smaller sub-parcels. Still, not every model arrived without damage. Damage, that fortunately has been reported as repairable. As a sort of Christmas present HVB received a new Schöma loco. After a short proces HVB took over the ownership from the old owner and we arranged the transport. 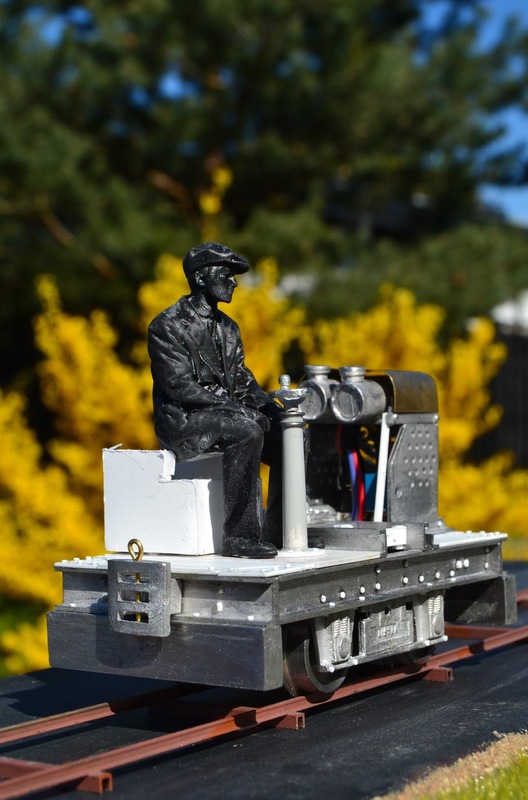 The loco has run under its own power within the last 15 years, but has a different gauge (785 mm rather than 700 mm). Time will show if the gauge can be changed. The 6 ton Schöma 2867/1965 will soon touch the rails. It will then be pushed into the narrow gauge industrial railway 'gene bank' building. The loco will reside here until it can be properly exhibited or restored and put into use. Photo: Hans-Henrik Schönthal.